I wasn't sure about this one at first, but after a few chapters, I was invested. 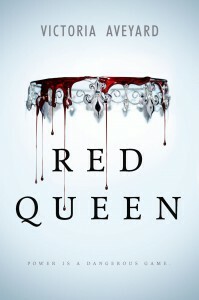 Parts of Red Queen reminded me of other recent dystopian YA books. There's an area that's contains dangerous levels of radiation, so no one goes near it. [POPULAR SERIES SPOILER AHEAD] It was no surprise to me that that was a trick and that people were really living there because I've read The Hunger Games. There's also a balcony scene straight out of The Selection . It also has the same common problem of using "highness" and "majesty" interchangeably. But I enjoyed the intrigue, the palace, the relationships, the betrayals, the villains... It's an engaging story.